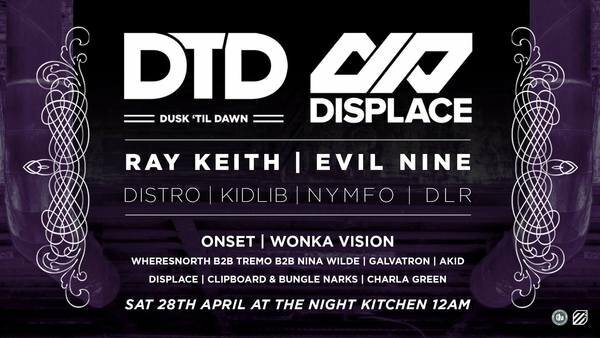 THATS RIGHT.. ITS THE FIRST DTD VS DISPLACE AT THE NIGHT KITCHEN!!.. This is gonna be absolutely Massive! TICKETS AVAILABLE FROM 7PM TODAY !!! Across 3 Battle Grounds, We have co-curated each room together to bring you a unique event, spanning many genres and including some of the absolute best in underground music from new and old. Drum & Bass whizkid with fans ranging from Noisia to Goldie and huge support from the likes of Radio 1. World renowned badman Bass, UK Funky and Breaks Producer/DJ from Bristol, whos huge tracks and collaborations with the likes of MyNuLeng and Flava D have torn up dances globally. Dutch DJ/producer with standout singles for RAM Records, Hospital Recordings and Metalheadz that have made his name synonymous with tough, techno-tinged dancefloor drum & bass. Not many can call themselves Boom-Town Residents.. but these bunch of raving reprobates are responsible for some of the Souths biggest and most insane events youv ever heard of... and their ability to rock any crowd with a clear unbeatable knowledge of underground dance music has seen them perform to thousands for well over a decade. Welcome to the North boys. Head honcho at Greenbay Wax, Sheffield's Kid Lib is a Junglist enigma.. Highly sought after in the Jungle community, his relentless offerings to the genre are unmatched! One of Yorkshires most prolific Jungle, Breaks and Drum & Bass DJ/Producers. Label Manager at Dispatch and rudebwooy D&B DJ from Brizzy.